Join us at the 9:00 or 11:00am Service! Each service is identical and features an outstanding group of musicians including Debbie Schofield, Steve Laico, Conner Crone, Mark Arnowitz, Bill Rome, Ivy Tulin and George Mindos. Wear your favorite Beatles-themed attire. Get there early and bring your friends, neighbors and family! 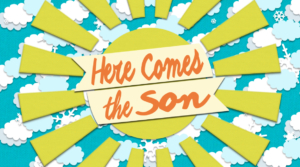 It will be a great Sunday at Christ Church! And remember: All you need is love and Here Comes The Son!